This is one of the more rare bicycle or cycle wrenches made or at least patented in the late 1800's era! This is a Schulz #109 featuring the special wheel spoke adjuster feature on it, (they were made with or without)and the nut wrench at the other end of the jaws. The wrench is marked with a "G" inside a diamond, and "PAT. JUNE 7TH 1892", the mark is rather light on the patent month and day. The patent was by Peter Gendron of Gendron Iron Wheel Co. in Toledo Ohio, and this company was known to operate until around 1925. 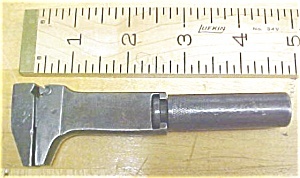 This is the first that I have seen of this 4.7" long (closed) wrench in many years of collecting. It's in good+ condition with about 0% of it original nickel plating on it, good staight beam and slide, adjusts smoothly, good serations on the spoke adjuster feature jaw. One of the nicer designs in pocket wrenches that I've seen! Very rare!